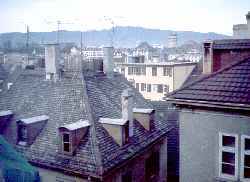 LEFT: The Hotel Franziscaner overlooks the Niederdorf quarter of Zürich, one block uphill from the east bank of the River Limmat. Thanks to its role as one of Europe's leading financial centers, Zürich has many excellent hotels. Unfortunately, many of them are priced too high for visitors without expense accounts. The good news is that, if you know where to look, you can find bargains on the Zürich hotel scene. In this article, we'll describe three hotels that we can recommend personally to travelers on medium to fairly low budgets. All three are on the east bank of the River Limmat, within a short walk of the main railroad station. The Hotel du Théâtre has long been a practical choice for guests with heavy suitcases or early-morning train departures. It's just across the bridge from the railroad station, near the lower entrance to the 109-year-old Polybahn funicular railway. Soundproof windows insulate guests against noise from the cars and trams outside. And if you have a room on the back side of the hotel, facing the nearby rooftops (see photo), you won't have to worry about noise at all. The Limmathof has been popular with cost-conscious American and European travelers for decades. It's still an unpretentious two-star hotel, but it was renovated a few years ago and now has full plumbing in all of its rooms. Wi-fi is free in all public areas (though not in guest rooms). The Franziskaner is located on a tiny square in Niederdorf, an "old town" neighborhood that is quiet by day and lively at night. 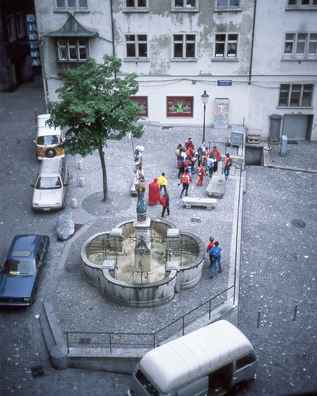 The hotel has its own small restaurant with a terrace (summer only) that overlooks the square shown in the photo above. If you like being near the action but away from car traffic, this is a great place to stay. You may hear happy whoops from passing nightclubbers after dark, but that's a small price to pay for such a delightful location.